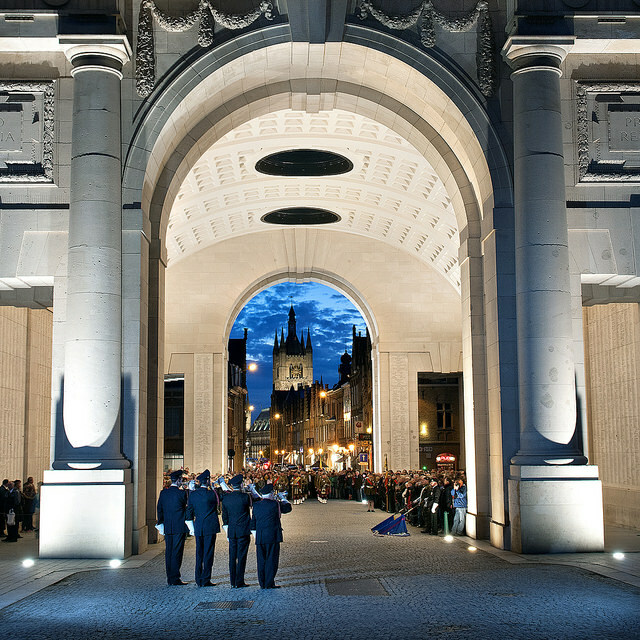 EN – I don’t think they feel as if we failed them, the 54.000 souls whose names are engraved at the Menin Gate. I guess they are quite surprised, really. After the war machine devoured them, there was no trace left of them. And yet it’s them, of all war victims, that are still remembered. Being remembered might not have been a surprise to them just after the war, when death was still new and the Menin Gate was erected to offer some footing for the immense feelings of loss that circulated the world: where, o where is he…? In those years, the few ordinary Belgians that passed by every evening to say goodnight by blowing a Last Post probably didn’t stand out much from the constant, endless stream of mourners beneath the Gate. And when the parade of visitors finally started to shrink, I guess the 54.000 found these Belgians quite fine blokes, showing up nightly in their working gear with their bugles at hand. In good and bad weather. In threes, sevens or just one. Came the next war and that would be the end of it of course, because at first the ceremony was forbidden and then there was this whole new generation of missing souls. And you know how it is: the youngest always gets the attention. But no. The Belgians returned, with their bugles, with their Last Post. The crowds diminished. Then grew again. And they were there, every evening, the Belgians. I don’t think they ever had expected such a thing, te 54.000 Menin Gate souls. 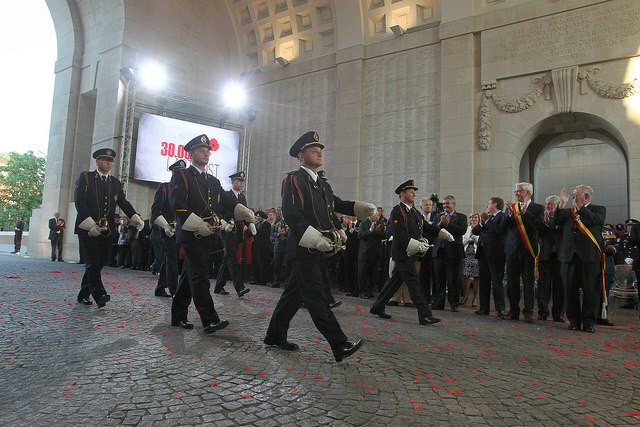 And if there was applause for the seven buglers of Ypres after they sounded the Last Post for the 30.000st time, I think they fully approved. I think in their silence they all joined the clapping, that night, there, under the Menin Gate.